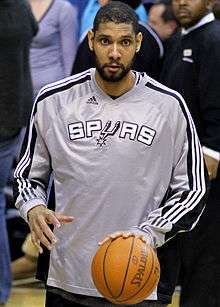 Tim Duncan is regarded as one of the greatest players, and power forwards, in the history of the National Basketball Association (NBA). 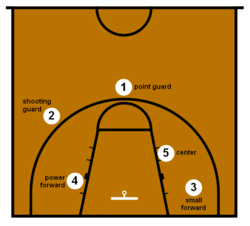 The power forward (PF), also known as the four, is one of the five positions in a regulation basketball game. It has also been referred to as the "post" position. Power forwards play a role similar to that of center in what is called the "post" or "low blocks". They typically play offensively with their backs towards the basket and position themselves defensively under the basket in a zone defense or against the opposing power forward in man-to-man defense. The power forward position entails a variety of responsibilities, one of which is rebounding. Many power forwards are noted for their mid-range jump-shot, and several players have become very accurate from 12 to 18 feet (3.7 to 5.5 m). Earlier, these skills were more typically exhibited in the European style of play. Some power forwards, known as stretch fours, have since extended their shooting range to three-point field goals. In the NBA, power forwards usually range from 6' 8" (2.03 m) to 6' 11" (2.11 m). Despite the averages, a variety of players fit "tweener" roles which finds them in the small forward and/or center position depending upon matchups and coaching decisions. Some "natural" power forwards often play the center position and have the skills but lack the height that is associated with that position. ↑ "ESPN.com's Greatest Power Forwards". ESPN. ESPN Internet Ventures. June 2, 2005. Retrieved June 17, 2007. ↑ Rosen, Charley (July 18, 2005). "Best all-time power forwards". Fox Sports. MSN. Archived from the original on July 19, 2005. Retrieved January 31, 2008. ↑ DuPree, David (June 7, 2007). "Tim Duncan: Best power forward ever?". USA Today. Gannett Company. Retrieved June 17, 2007.